Eighteen months ago, QNews Magazine featured Chris Pye and Sophiaan Subhan who had then spent almost a year as foster parents. 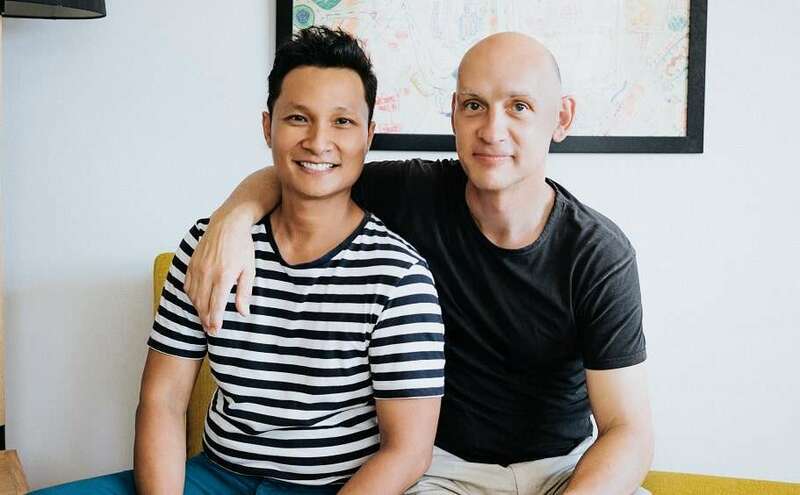 QN Magazine recently caught up with this amazing couple and discovered they found the experience so rewarding, they’re now proud foster dads to two children, the original child and his biological brother. Fostering is a special commitment that requires people with extraordinary hearts. It presents challenges outside many people’s life experiences but can be equally rewarding. Foster carers come from all walks of life, but all have one thing in common. They have a place in their hearts for a child who needs love and understanding to get the best possible start in life. After eight years together, Chris Pye and Sophiaan Subhan married in New Zealand in 2015. For years they thought about having a family but considered their chances slim. For six years they considered the idea of fostering children. They talked about it, read about it, asked questions about it, and finally attended an information evening which decided their course of action. They registered as foster carers. Children have different needs so different types of care are required. Some carers bring children into their home for a few nights, some for a few months, a few years, or longer. Others provide emergency care or give short breaks to other foster carers. Chris and Sophiaan decided on long-term care. As an alternative to adoption, long-term care provides children with a permanent home while preserving their identity, relationships with their birth family and connection to their culture of origin. With the decision made, they realised their small house on a major road was not ideal for a family, so they sold up, and bought a larger house in a leafy suburb more suitable for a young child and a dog. During the final stages of home improvements, after an assessment process and successful accreditation, Chris and Sophiaan received notification they would soon become foster fathers. “We were at the tail end of major renovations and racing against the clock to get it done,” Chris recalled. Only hours after the final tradesmen departed, the new foster dads welcomed into their home a boy from a traumatic background, dislocated from his biological family. Sadly, at the age of seven, the child had already passed through multiple homes. He needed stability. However, the child was in what the couple terms “survival mode”, performing to the best of his ability in the hope of staying with the new family. His behaviour became more erratic. He and Sophiaan assured the child they would never push him away and never give up on him. The couple takes time together each evening to discuss any challenges that arise. Chris says a strong relationship is essential. He talked about the joy of seeing a whole new side to his husband and the exhilaration their new experiences as a family brought to their relationship. Sophiaan said that having two dads appears to be a non-issue with their son, who has a close friendship with the child of two mums. Although their foster child was dislocated from his family, he needed to maintain contact with his siblings. On contact visits with his younger brother, Chris and Sophiaan saw the importance of the relationship to both boys. They discussed the potential benefits of the brothers being able to live together in a family environment and be present in each other’s lives. When the opportunity arose, they applied to care for the second child. Speaking to Chris and Sophiaan it’s impossible not to notice the pride they have in the two children and the love they have for them. Chris and Sophiaan are excited to have expanded their family and look forward to giving their boys a future of adventure, broad cultural education, stability and family consolidation. “In the next few years, I’m looking forward to seeing them grow to become emotionally stable,” said Sophiaan. “I had given up on ever having a family,” said Chris, “I thought I was too old. But it doesn’t matter how old you are, your gender, your sexuality, your marital status or your cultural background. To find out more, visit the website here or phone Queensland Foster and Kinship Care on 1300 550 877. To apply, you can complete an online Expression of Interest here. Brought to you by the Queensland Government and Queensland Foster and Kinship Care.